Island-inspired libations fuel this Los Feliz dive bar, where kitsch is embraced as emphatically as coconut cocktails. 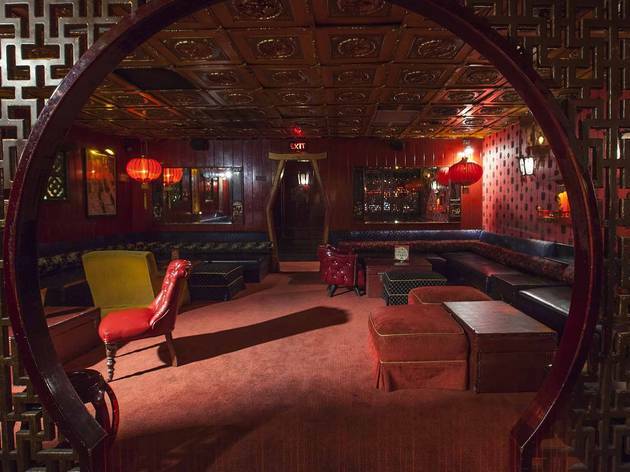 There's a solid collection of tiki bars in LA, but despite the presence of coconut-infused cocktails, Good Luck Bar seems to straddle the line between tiki bar and straight-up dive. 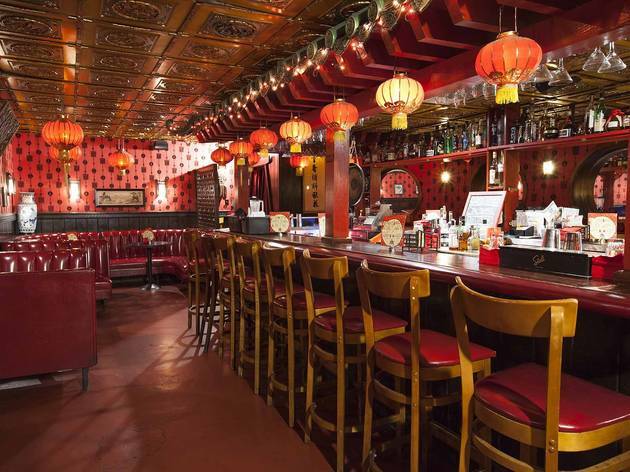 To find the space, look for “Luck” in neon lights along Hillhurst Ave.; inside, it’s all shadows and eccentric personalities befitting of a proper tiki bar—except for fluorescent-red Chinese lanterns, wooden dragons overhead and a Buddhist temple that doubles as the bar. Sipping rum-fueled concoctions out of ceramic coconuts in a space that seems more suited for a quiet game of mahjong can be confusing. It's best not to try and decipher the situation here at Good Luck. Instead, take your chances on some feel-good libations like the rest of the crowd. Loosen up with the deceptively strong house special, aptly named the Potent Potion ($10)—spiced rum, fresh pineapple juice and homemade coconut cream all blended together, then sprinkled with nutmeg and toasted coconut. After a few of those, you’ll feel right at home. Good for: Forgetting all of your troubles. Why is it that drinks served in coconuts make everything better? 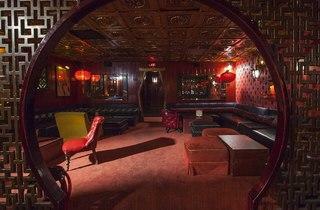 Sprawling, windowless and dimly lit with loads of worn-in banquettes, this is a quintessential date spot for Eastsiders. A menu of delightful cocktail drawings makes choosing a tiki tipple easy, so forget reading the ingredients and just order the one that catches your eye—perhaps a blended mojito served out of a goblet in the shape of an angry Asian man’s head? That one’s called The Scholar ($10) and is a top-notch conversation starter (if you can hear each other over The Clash rattling from the jukebox). If all else fails, head to the back room and make out. The scene: The dress code is skinny jeans, plaid and, of course, thick-framed specs. We are in Los Feliz, after all. It’s definitely the place to be cool, covert and drunk on a week night. 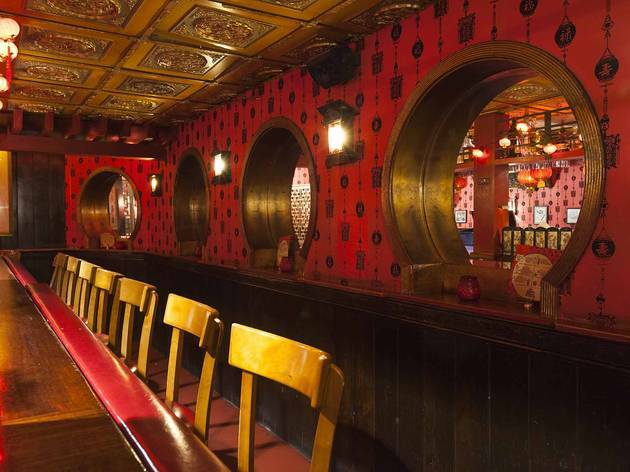 Most of the bar's patrons live nearby, and you'll find it easy to strike up a conversation with a stranger—the kitschy glassware gets people talking. Drink this: In true dive fashion, all drinks here are tall, stiff and $10 across the board. We already covered the bestseller, the Potent Potion—splitting with a date or drinking for two is entirely up to you. For a runner-up, the crimson-colored, jalapeno tequila-fueled Master Minsingmah strikes hot and fast, but the finish is utterly refreshing thanks to lime and watermelon juices, agave nectar, and ginger beer. Old Boy is another crowd pleaser, mainly because it’s a little house party in a big tiki glass. We’re talking not one, not two, but three types of rum, plus orange-flavored liqueur. Sip one of those and you’ll quickly drift away to the sandy beaches of Vanuatu. Our tip: If you happen to be driving here, park in the vacuum cleaner store lot just north of the bar. After hours, it’s free and legit. 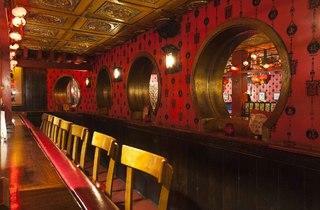 Good Luck Bar is pretty hip and a Good place to get a swanky tropical/tiki drinks or mixed drink. Not a place if you're trying to get destroyed or drink a bunch of beer, but a great date spot or place to go with a group of friends if you can get a booth in the back. Also, cool rock n roll music! Super, super cool place. I recommend getting there before the rush, snagging a seat and staying for as long as you can keep getting down those tiki drinks. 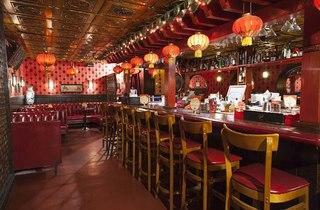 The red lighting, comfy booths and oriental decor make Good Luck Bar an awesome date spot and place to get luck-y. I really dig this spot, although I can see how it might be a bit of a beast when the room fills up and there's nowhere to sit. There's a lot going on here - pagodas and Buddha statues and lanterns - but the tiki drinks are delicious and avoid the saccharine sweetness that comes with similar cocktails. Try to snag a seat on the comfortable couches if you can. Good Luck Bar can be anything you want it to be--enigmatic "oriental" decor and tiki cocktails make this a great spot for a date or just a neighborhood meetup with friends. All of the cocktails are strong and tasty, and there are a couple of options if you're more of a beer person. A great neighborhood spot, but also highly worth making a trip to try! Also their matchbooks are damn cute.